Habib Malik Orakzai, Chairman of the Mutahida Qabail Party (MQP) and President of Pakistan's International Human Rights Organization (PIHRO): "There are strong feelings all around the Muslim world that Afghanistan is under deadly occupation. As those installed by the US - including Karzai - have no legitimacy, the writ of the "government" is nowhere prevalent beyond the "city state" of Kabul. America and NATO have now realized that they should talk to Taliban but there seems to be no quick way out. The way out has to be found. One can argue that the FATA situation will hardly stabilize unless the occupying forces get out of Afghanistan." Habib Malik Orakzai is the Founder and Chairman of Mutahidda Qabail Party (MQP), the first political party to represent and serve the tribal people of the Federally Adminstered Tribal Areas (FATA) in Pakistan next to Afghanistan, and President of Pakistan's International Human Rights Organization (PIHRO). He is also a member of the Advisory Board of the World Security Network Foundation (WSN). In his discussion with Dr. Hubertus Hoffmann, President of WSN, he explores the current situation of the Federally Administered Tribal Areas (FATA) in Pakistan and talks about prospects for Afghanistan. Hubertus Hoffmann: How dangerous is the situation now in Pakistan’s tribal areas (FATA)? Habib Malik Orakzai: Pakistan's Federally Administered Tribal Areas (FATA) had been peaceful before 9/11. The ongoing insurgency is not a local phenomenon; rather things have spilled over into Pakistan from across its Western borders where American and Allied Forces have drastically failed in achieving any of their stated targets. NATO and America have been launching military operations without informing Pakistani authorities and this has resulted in foreign militants being pushed into Pakistani areas. Agreements with militants that could ensure peace in the area were sabotaged with airstrikes and propaganda - resulting in expansion of the militancy. Youth of the area are fast in joining the militants, which is one of the reasons that FATA is underdeveloped, with scarce social services and virtually no job opportunities, despite the territory having vast potential for development, particularly in the mineral sector. For immediate and long-term peace and development in the region, dialogue should precede military action. National strategy about the "War on Terror" itself needs a review and the development potential of FATA needs to be exploited. Today, FATA is being labeled as a cause and center of militancy by many, not only in Pakistan but in the entire region. While the Afghan government and the international community is blaming Pakistan for providing a safe haven to militants in its tribal belt, the government of Pakistan believes that the growing number of suicide attacks and other violent incidents have their roots in this area. Meanwhile, the people of FATA feel that they are being subjected to killings and forcible displacements not only by the US and NATO forces but by the Pakistani army and the militant groups as well. While the international community and global media are describing FATA as the cause of instability in the region, most people in the country and even outside believe otherwise; that is, it is basically the consequence of the presence of foreign forces in Afghanistan. Pakistan has deployed 100,000 troops to the border area to control cross border militancy; however, the Afghan government is not taking serious action for stopping the militants from Afghanistan to carry out terrorist activities in border areas of Pakistan. Due to ongoing War on Terror (WoT) in Kurram Agency, thousands of local and innocent residents also suffer and are forced to live in miserable conditions. Similarly the drone attacks are also increasing militancy in the area. Hubertus Hoffmann: What do the people in FATA need most? Habib Malik Orakzai: The population of FATA is 6.7 million and the most important thing is to understand the entire situation properly. Seeing FATA in isolation and not in the context of the Afghan war would not lead us to the right conclusions. One has to have a comprehensive approach; FATA is not to be separated from the big picture as doing so will only lead to superficial results. A comprehensive approach means addressing the problem regionally with the aim of resolving this problem in Afghanistan, FATA and the rest of Pakistan. Democracy and institutions need to be strengthened and encouraged and political solutions have to be found. Pushing Pakistan to "do more" will only destabilize the country. For FATA, the most important step is to bring the area into national mainstream. Administrative and political problems of FATA need to be resolved; particularly the colonial system of administration needs to be reorganized. Substantial socioeconomic developments are needed at this time. Sustainable Development Plan needs to be supported. Top priority has to be given to education and especially the deficiency of teachers must be dealt with immediately. Job opportunities for the youth of the area should be created. The potential of mineral sector awaits exploration. Military operations should be launched against specific targets but only on the information of credible intelligence sources in order to avoid collateral damage and alienating the people. Air strikes/drone attacks are not favored at all, whether from outside or within the country, as these only alienate the people and cause tremendous damage. Dialogue needs to be encouraged. Tribesmen should be taken onboard as their support is required. Talks should also be held with the militants in a meaningful manner. In this connection, Pakistan needs to take independent decisions and resist pressure from outside. Hubertus Hoffmann: How many of the people are radicals and how many Taliban or terrorists are there? Habib Malik Orakzai: Mainly there are two types of militants present in the area: the Taliban and al-Qaida. It is important to differentiate between Taliban and Al-Qaeda as in the definitions of Americans and the allies both are placed together. Though Al-Qaeda was identified as masterminding 9/11, it had nothing to do with Taliban. There is no doubt about the fact that Osama bin Laden, at that time, was residing in Afghanistan and the then Taliban regime provided him shelter. But it does not mean that they played a role in whatever happened on 9/11. None of the perpetrators of the 9/11 attacks were Afghans or Pakistanis. The problem lies here and it is not appropriate for Pakistan to alienate the Taliban. It is not being suggested here that all the Taliban should be protected but they should at least be considered as stakeholders. This step is necessary for any future stability in Afghanistan. Trying to eliminate resistance indiscriminately is not going to solve the problem. Al-Qaeda is an international organization or a group with its own objective. Taliban, on the other hand, are local - a regional entity - and have to be seen as such. Pakistan should not take foreign pressure for dealing with the Taliban. However, within the Taliban there may be some hardliners and miscreants and they need to be identified and dealt with accordingly. The extremists are not in the majority to cope with but the issue is their identification. "The main reason behind the situation in FATA is lack of education; hence, you can understand the importance of education." Hubertus Hoffmann: How important is education for the young people? Habib Malik Orakzai: Education is of great importance and it plays a pivotal role in development. Young generation is our future; hence, it is our duty to provide them with quality education. The main reason behind the situation in FATA is lack of education; hence, you can understand the importance of education. I would like to take this opportunity to thank the World Security Network (WSN) for offering scholarships to the young students from FATA. However, I would like to request donors and other organizations to provide special scholarships to the talented students from FATA. Hubertus Hoffmann: Please tell us about your new FATA party, what are your aims and how to reach it? - Declare FATA as a Separate province. “Since the inception of the country successive governments have never bothered to give due rights to tribesmen. The huge funds allocated for uplift of Fata have also not been spent on development of the neglected areas”. 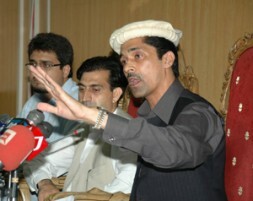 Being the first political party for the people of FATA we are welcomed by the locality and they are joining our party. I am sure that in the next election MQP will play its role for the people of tribal areas and win victory over corrupt and selfish parliamentarians. Hubertus Hoffmann: What can the Arab World or the U.S. and Europe do to help and improve the situation in FATA? Habib Malik Orakzai: International community should give proper attention to the tribal areas of Pakistan despite negligence. Development works should be started with immediate effect and locality should be involved in the development process. Special focus should be given to education and institutions should be constructed at agency level. Employment opportunities should be provided to the residents of tribal areas of Pakistan on equality basis. Hubertus Hoffmann: What does your peace-concept for Afghanistan - including the important interests of Pakistan - look like? Habib Malik Orakzai: To understand the situation in FATA, it is important to have a look at where Afghanistan stands today. Statistics and indicators are worrisome. Poppy economy is estimated at some five billion dollars and it is alleged that everybody including the government functionaries, from top to bottom, are involved. 93-95% of the world’s heroin is produced in and exported from Afghanistan. The country (Afghanistan) stands at 174 out of 178 countries in the UNDP Human Development Index, for a population of only 30 million, which is less than NWFP. While all the money promised to Afghanistan did not materialize, still billions of dollars, have come - US $15 billion against the promised $25 billion. The question is mind boggling: where have these billions of dollars given to the country as reconstruction aid gone? The only notable development is in the form of rebuilt strategic roads - with the main purpose of enabling the troops to move around. In terms of corruption, Afghanistan stands among the top ten most corrupt nations in the world today. There are indications that corruption is now deeply rooted in the present day Afghan system. Unfortunately, people at the top are also not free from this malaise as the latest reports allege that those at the helm of affairs are involved as well. So while looking at the troubles that FATA is caught in today, one has to keep in view the situation next door. However, it is not the Afghan state that has failed, but it is the failure of the system that has been in place as a result of US intervention. Enough blood has been shed in the name of 9/11 and collateral damage still continues in Afghanistan. It is well documented that Americans had planned to topple the Taliban regime using various means - including some of the neighboring countries - around September-October of 2001. Even if there was no 9/11 there would have been a major international intervention in Afghanistan in one form or another. While the intervention was made and it continues, it is not clear what really are its parameters and goals. Now there are strong feelings all around the Muslim world that Afghanistan is under deadly occupation. If a free and fair opinion is taken in Afghanistan, some 95% of the Pushtoons and a large number of Uzbeks, Tajiks and other ethnic groups of the country would say that they do not want the presence of America, NATO and the rest. While they may not say so in public, even people at the top including ministers, members of the parliament and Loya Jirga are increasingly becoming wary of the prolonged occupation. Even those who are apparently working with the administration in Kabul are only doing so for the sake of survival. Instances have been witnessed where one brother is working in the Afghan army and the other with the Taliban. As those installed by the US - including Karzai - have no legitimacy, the writ of the "government" is nowhere prevalent beyond the "city state" of Kabul. America and NATO have now realized that they should talk to Taliban but there seems no quick way out. The way out has to be found. One can argue that the FATA situation will hardly stabilize unless the occupying forces get out of Afghanistan. Pakistani officials and scholars are absolutely right when they recall the historical facts about several thousand nationals from different countries coming to Afghanistan and Pakistan during the war against the former Soviet Union and how these people then remained in the region even after the Soviet withdrawal. The irony is that the majority of them truly believed that they were coming to defend Islam and to conduct a holy war. Everyone knows all that happened then and how many of these foreign nationals remained in the region, assimilated with the locals, got married and continue to live here. Pakistan today finds itself at a very critical moment in history. It is time to realize the need for change in the policies being followed regarding the War on Terror as the present ones need to be discontinued and then work out a roadmap. It is, therefore, very important to make an objective balance sheet of what has been achieved through our participation in the American-led war on terrorism and of all that we have lost. Today, Pakistan is encircled by all sorts of enemies and conspiracies and it is time that we put our heads together. A new US administration is about to take office and despite so many depressing past experiences it is important that meaningful input from intellectuals and policy makers in Pakistan is presented and shared with the US policy makers so the two countries can work together for a genuine and durable peace in our country and in Afghanistan.